Even the lunch breaks were used to share knowledge with the community on the roof top of the conference center. We had two great days together in the sun - with nice majorician food. 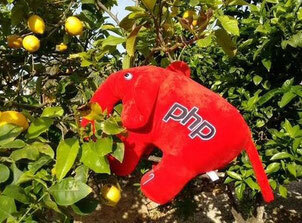 Without our sponsors there would be no PHP Unconference. There would no food, no internet, no drinks, no social events, no shirts and of course no rooms. We hope to see you all next year! Planning of 2016 has begun ... we do our retrospective on Thursday. Please read the blog or use the newsletter list to stay informed.